Thank you for choosing SurveyMaker! Welcome to the User Guide for Adobe Connect. 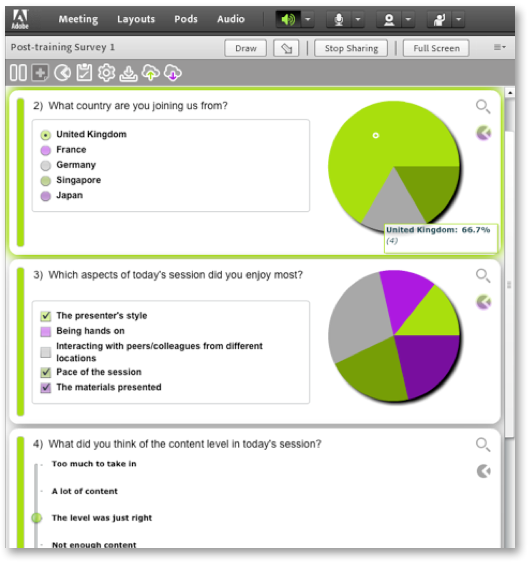 SurveyMaker enables Hosts and Presenters to create and deliver tailor-made surveys for attendees in your Adobe Connect virtual room. It also allows you to collect and analyse the answers to your survey questions immediately within Adobe Connect, as well as providing options to export your data to other apps for later use. Surveys can be stored in your ActiveC cloud account, enabling them to be reused again in future online sessions. The links to the left will help you find your way while using SurveyMaker, just click to find out more.